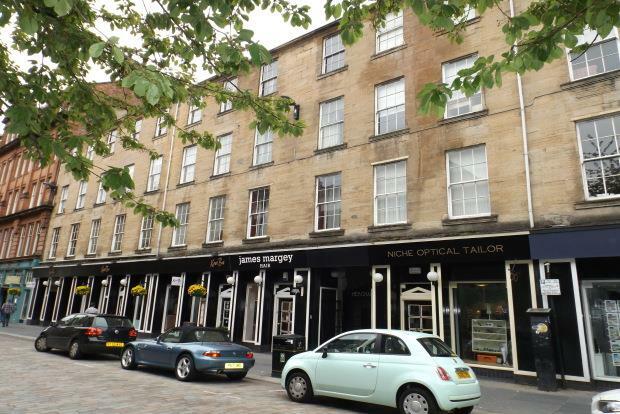 Candleriggs is at the heart of the Merchant City and is steeped in history and fine traditional architecture. Adjacent to Ingram Street, the city's 'style mile', you have some of the country's best shopping within easy reach and the absolute best of Glasgow's pubs and restaurants on your doorstep. The daily shop is available just around the corner at Tesco, as is the morning coffee, the lunchtime sandwich, the afternoon dry cleaning pick-up, dinner with friends and the cocktail nightcap befo re bed, this part of the Merchant City has it all within yards. Glasgow Central and Queen Street train stations are a couple of minutes up the road with easy access around the city or to the rest of the UK. Frequent buses take tenants to each corner of Glasgow with ease, and a parking permit is available from Glasgow City Council at the fantastic rate of 68 pence per day. The flat itself is located on the second floor of this very popular development. It compromises of lounge, with kitchen at the back, convenient when entertaining guests! One large double bedroom with double bed. The bathroom is fully equipped and has a shower over bath, for those more relaxing evenings or a quick dash out. The property also benefits from electric heating and secure door entry.